As part of the Schoolhouse Review Crew, we recently had the opportunity to review We Choose Virtues Parenting Cards. The Parenting Cards are to be used by the parents (obviously) to instruct their children and are available in both King James and New International Readers Versions. (We received the NIV.) The King James Version Parenting Cards uses Old Testament verses only, as they were created for Jewish families who teach their children from the Old Testament. The International Readers Version has verses from both Old and New Testaments. Both sets of the cards however teach the same set of virtues: diligence, helpfulness, perseverance, gentleness, contentment, attentiveness, honesty, kindness, self-control, patience, obedience, and forgiveness. The Kids of VirtueVille coloring book has a different coloring page for each virtue and three puzzle pages. The Family Character Assessment is a form for each family member to use to evaluate where they might need work on each virtue and to set goals. The Teacher’s Handbook includes tools and ideas for how to teach the virtues to your children. And lastly, the Butterfly Awards are cute certificates for you to give to your children when they have succeeded in a certain virtue - just fill in their name and the virtue. This set is recommended for children ages three to eleven. My kids have really been enjoying learning about the different virtues. We had done a character study before on virtues but it wasn't very in-depth past the scripture. I feel like the characters and their stories in We Choose Virtues really drove home the points of what the virtues were about AND what they were not. They really helped the kids to grasp it. I chose to read aloud the cards and discuss the virtue with them while they colored. (Zeke also really enjoyed the puzzle pages - they were a little bit hard for Ellie to do yet.) We have been choosing one virtue each week to "study" and try to apply throughout the week - for instance, we started with obedience. We read the card and colored on Monday and then made a point each day to discuss it first thing. I would remind them of Oboe Joe and the phrase on the card ("Ok, whatever you say, I will obey, right away") and then say, "Let's see how we can be obedient today." 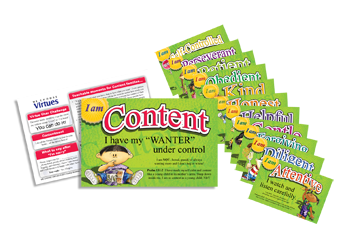 The Parenting Cards are available for $38.49 and the WCV Download Bundle is available for $7.99. Click the button below to read more reviews from Crew Members who also received this or who reviewed the Youth Journal!